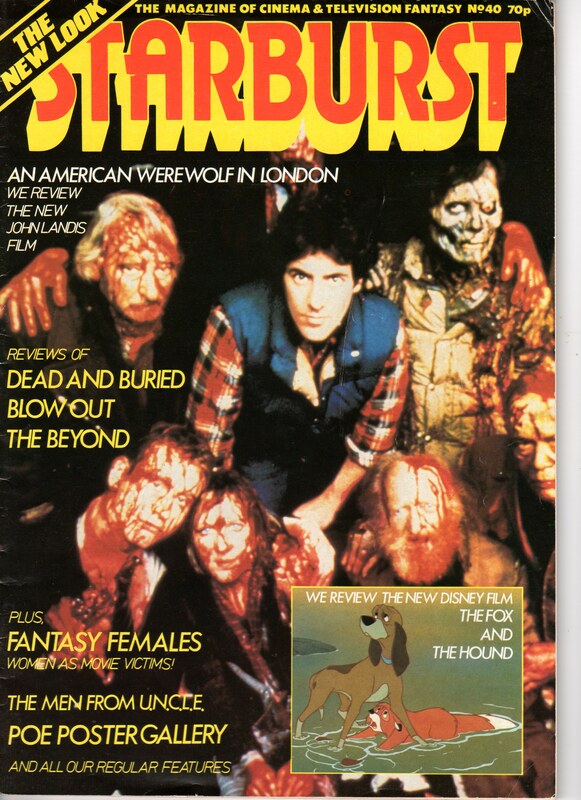 There was time when STARBURST was appealing to the FANGORIA market and the AMERICAN WEREWOLF IN LONDON issue (No. 40, Volume 4, Number 3, 1981) has a cover that is drenched in blood, featuring a publicity still, with the incongruent promise of Walt Disney’s FOX AND THE HOUND (1981). It was different times. Inside the magazine, it was not much better, with the emphasis on the gore and gorged eyes from DEAD AND BURIED and THE BEYOND. I have bought the copy that I have now on e-bay as my original copy was cut up to appear in a school project. We were asked to produce a magazine about the strange and the unexplained. I relished the exercise, producing a magazine that was named ENIGMA and featured stills from this copy of STARBURST. I was given a good grade for the work, but was asked to remove the pictures of throat-cutting nazis. I don’t know why it caused so much offence.